I made this guide because there is a lot of misinformation on the internet about the different polishers and buffers available. The majority of reviews, lists, and guides are either confusing or just flat wrong. I’ve spent several weeks compiling information and combing it with my own personal experiences to try and make you the most accurate and easy to read guide on polishers so you don’t waste any of your hard earned money. As you’ll read in this guide, there are many different makes and models of polishers. Most of them are almost the same and just have different warranties, cord lengths, or accessories. BONUS: Don’t have to time to read this article? You’re in luck! Download my free sortable and filterable version of this guide by clicking here. To help you sort the differences more quickly I created a side-by-side comparison guide here. Dual action random orbital polishers (DA for short) are buffers that spin the polishing pad on a separate axis from the spindle. This creates a looping pattern that prevents heat buildup and buffer trails (visible holograms/patterns in the paint from the spinning pad). This action makes these polishers very user and paint friendly. They take a little longer to polish paint but they do so with a much higher safety margin. You would almost have to throw your DA at your paint to hurt it! Haha. These are my favorite type of polishers and the ones that I recommend to all novices and intermediate car detailers. This is the DA that started it all. Originally developed as a dual action sander this polisher was discovered to be a great polisher once a foam pad was attached. It’s the foundation to which most early DA polishers were built from. This buffer is affordable, dependable, and sold nearly everywhere since it’s produced by a popular tool manufacturer. The 7424xp is little on the loud side of polishers with a fair bit of vibrations but overall a great entry level DA buffer for the money. Keep in mind you’ll need to purchase a backing plate such as this one with this buffer. The one it comes with is insufficient for using interchangeable buffing pads. This is for the people that want to try out paint correcting but don’t want to risk a lot of money up front or gamble on a tool. A real work horse. A micro version of the venerable Griot’s Garge 6” orbital polisher. 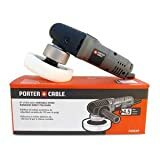 This polisher ditches the large counter weight and shroud to allow for fitting a small 3” backing plate to run small pads for polishing tight places. It still includes the replacement brush and lifetime warranty of its larger sibling. The orbital motion prevents the small pad from burning the paint making this super safe. Anyone who polishes a lot of tight spots and doesn’t want to switch to hand polishing. Works great on motorcycles and trikes including the Spyders and Slingshots of the world. The first true random orbital cordless polisher. It doesn’t have enough battery time to do a full pant correction in one run but it has enough to either fully correct a panel at a time or apply a sealant or wax to an entire SUV. Runs a 5” hook and loop backing plate so it’s compatible with all 5.5” and up foam and microfiber pads. Includes 5.5” black foam finishing pad for waxes or sealants. Also includes one battery and battery charger. Extra batteries are available, though pricey. Anyone who hates cords or wants a more sophisticated way to polish and wax their car at a car show or during a car meet. A more refined and powerful version of the Porter Cable 7424xp. This polisher has a bigger motor and runs up to a 6” pad without issue. It comes with replaceable brushes to ensure a long motor life. It also includes a lifetime warranty, the longest warranty out of any other brand polisher. The top mounted handle, rubber grips, and finger grooves help improve the ergonomics of this polisher over other similar style DA polishers. Anyone who appreciates a more refined tool than the PC 7424xp and a lifetime, no BS warranty without having to break the bank. A combination of the safety, power, and ease of use of the previous GG6 6” polisher with the latest advances in buffer tech. This buffer includes a longer 15mm throw to allow for faster removal of defects over a larger area and smoother operation. The porter cable style body has been replaced with a more traditional rotary style body with pistol grip, variable speed trigger, and trigger lock. 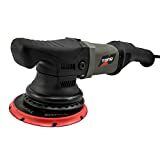 Anyone with more money than time or anyone who plans to use their polisher a lot and wants a more refined tool that works faster, smoother, and quieter to reduce fatigue. The lifetime warranty seals the deal over other similarly priced and built tools. The bigger brother of the G15 above. Everything is the same except for the throw and included backing plate. It has an even larger 21mm throw and counter balance and 6” backing plate to allow even faster correction of large areas and even smoother operation. The same lifetime guarantee applies. Register the polisher online and they will include replacement of normal wear parts for 2 years. Longer than most polishers regular warranty. Anyone with more money than time or anyone who is going to polish a lot or has to polish a large area like a full size truck or RV. 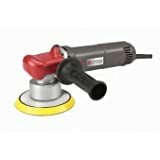 This polisher is also very smooth so anyone who suffers from joint paint and can’t tolerate a lot of vibration will want to opt for this over smaller short throw polishers. Intended to aid in polishing tight areas using air power instead of electric. This tool falls flat of that purpose due to poor build quality and lack of power. Anyone with easier access to compressed air than electricity and need to polish small areas. You’ll need to be handy as well because the tool is full of air leaks unless you rebuild it upon arrival. It’s cheap and extremely light though. If you’ve ever used an air sander you’ll be intimately familiar with this tool. It’s light weight and powerful and runs on compressed air. The 10mm stroke allows it to be affective at both waxing and polishing. Available with either a 5” or 6” backing plate it is compatible with all mainstream foam and microfiber cutting and polishing pads. Anyone with a preference for air tools over electric or who wants the lightest tool they can get their hands on. Similar in almost every way but price and warranty to the Porter Cable 7424xp. It’s rougher around the edges, being a fair bit noisier with worse vibration. It’s a lot cheaper though. The warranty is unacceptably short at only 90 days but if you have a Harbor Freight nearby you can buy it over the counter for instant gratification. Anyone wanting to try out the paint correction and detailing hobby without spending much money. You can always upgrade later and relegate the HF DA to sanding duties. 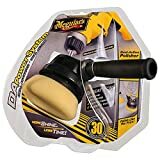 This is the replacement for the old Meguiar’s G110 polisher which was based off of the Porter Cable 7424xp style DA polishers. This new polisher trades that style for the more traditional rotary style ergonomics including a pistol grip, variable speed trigger, and trigger lock. This polisher also includes a feature called cruise control that will apply more power to the pad to maintain speed if it detects the pad is slowing down. Another things worth mentioning is that this polisher does not include a backing plate. You’ll need to purchase one separately before you can start using it. They did this because most people have a preferred backing plate and it would reduce the sale cost of the machine. 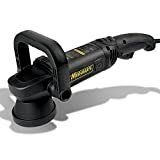 The drawback to this polisher is that there are lots of reports of the cord failing early and people struggling to get it fixed under warranty. I’d suggest waiting this one out to see if Meguiar’s gets a handle on the cord issue. Otherwise it’s a great polisher. Anyone wanting a more sophisticated buffer and who prefer the rotary style pistol grip over the PC style body. This isn’t a buffer in and of itself. It’s an adapter that allows you to turn a power drill into a dual action random orbital buffer. It’s not the most exciting or comfortable to use but it’s cheap to get into and works. If you just need to do minor correction work or a one-and-done type deal and you already have a power drill this is your ticket. It’s cheap and works. Just don’t expect to get much more out of it and actually enjoy it. Another copy of the Porter Cable 7424xp style DA polisher, albeit with a worse warranty (that I had to dig to even find) and non-existent customer support. This polisher doesn’t really bring anything to the table other than better marketing and availability online. Chemical Guys are great marketers. I can’t really recommend this polisher to anyone. It doesn’t really fill any market needs between the Porter Cable 7424xp and the Griot’s Garage 6” Orbital. I also don’t like that they aren’t very forward with their warranty and support. 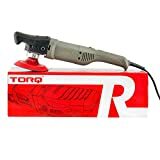 Similar in form and weight to the Meguiar’s MT300 this tool has the more traditional rotary style pistol grip but foregoes the trigger for a power switch and buttons to increase and decrease speed. The speed is also output on a digital screen instead of a dial like most polishers. Like the Torq X I don’t that it only has a 1 year warranty and you have to dig around to even find it mentioned. Anyone who prefers a digital read out of speed or dislikes holding a trigger down to control speed. This is Chemical Guy’s first foray into long throw polishers. It comes off as a budget alternative to polishers like the Griot’s Boss G21 and the Rupes 21 Mark II. It has similar throw and power but the build quality is noticeably less. Also, one if it’s greatest features is it’s worse. The digital stepper motor resets to zero each time the tool is turned off. This helps maintain control when turning the tool back on but also makes it a chore to get back up to full speed when you’re just stopping to blow out your pad or add more product. 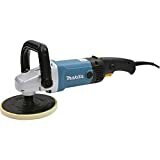 Anyone who wants a long throw polisher but can’t swing the $350+ it takes to get into the Griot’s, Rupes, or Flex tools. If you find that you enjoy the hobby this tool will last you until you get more funds or the next latest and greatest tool catches your eye. Using a unique dual head design the Cyclo 5 is built to mimic the motion of hand polishing but at much faster rate. The heads rotation in counter clockwise rotation opposite of eachother to perfectly counter balance each other. The tool even includes replaceable weights to tune the balance to the pad you’re running to ensure it stays as smooth as possible. Smoothness really is the advantage of this tool over other polishers. It’s not going to work as fast as a rotary or large long throw polisher but it’s going to be the smoothest buffer you can buy. The drawback is that this polisher only has one speed, On. If you want variable sped you’ll need to step up to the pro below. Anyone looking for the smoothest polisher available and wants it built like a tank. Great for people with joint paint that can’t tolerate vibration. The Cyclo 5-Pro is similar in alsmot every way to the regular Cyclo 5 except it introduces variable speed. The speed starts at 650 and can be increased to 3000 orbits per minute. This will help with controlling the polisher and slinging of product. The Cyclo 5-Pro is also sold as a Cyclo 5-Pro HD variation that includes a longer heavy duty 16 gauge 25 foot power cable instead ot he regular 10 foot power cord. Those people who value to smoothness and control over speed and detail. You won’t’ find a smoother polisher. If you have joint paint that reduces your ability to tolerate vibration without more pain you’ll want to pick up a polisher like this one. Arguably Flex’s most popular model, this polisher brings a new feature to the traditional orbital polisher: Forced Rotation. The Flex XC3401 has a positive drive that keeps the pad spinning even when pressure is applied. Traditional DA polishers rely on the force of the offset spindle whipping the pad into the rotation. The Flex forces the pad to rotate using gearing. This means you can push your pad faster and harder to achieve better results faster. The downside to this forced rotation is can make the tool jumpy. If you’re working on uneven surfaces the tool has a tendency to dance around on you requiring a little more effort on your part to maintain your path. Overall the Flex XC3401 is a happy medium between a rotary polisher and DA polisher. You get the speed and power of the rotary without the risks to burning your paint thanks to the “random” orbital pattern. It also includes all the bells and whistles of professional grade polishers like cruise control, soft start, and speed control. Anyone who wants a tool that won’t stall when the smallest amount of pressure is applied and wants a higher quality professional grade tool that will last a lifetime. This is Flex’s free spinning long stroke competition to the Rupes BigFoot and Griot’s BOSS series orbital buffers. The 15mm throw/orbit allows covering more ground faster. The speed and power that Flex is known for is definitely there with a max speed of 8600 orbits per minute. The overall design and feel of the polisher is similar to the xc3401 with the exception of being slightly slimmer and a little more rounded. The speed and power is familiar as well. Flex also included more vent holes to keep the tool cooler and direct the heat away from the operator. Compared to other 15mm throw polishers the Flex uses a larger 6” backing plate to run larger 6.5” pads. Anyone who wants the Flex build quality in a free spinning long throw polisher to cover more area faster and smoother than traditional DA’s. You’ll spend quite a bit more money but you’re not likely be left wanting more. A real, buy once, cry once experience. It’s also ideal for motorcycles, trikes, and the Can-Am Spyders and Polaris Slingshot’s of the world that don’t have single flat panel on them. 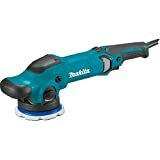 Makita BO6050J Random Orbit Sander, 6"
This is a unique polisher that allows for switching between traditional free spinning orbital polishing like the Porter Cable 7424xp and forced orbital rotation like the Flex XC3401. It really is a 2-in-1 type tool and works great. The modes are switches using a knob that you can adjust while the tool is off. 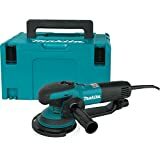 If you’re unsure if your paint will correct enough with a free spinning polisher then the Makita will solve that problem for you by allow you to take it up a notch if you need to by locking in the forced rotation so you can bear down on the pad more. The body is similar to the PC style with the short body, top switch, and side handle. It includes rubber grips like the Griot’s 6” Orbital so you won’t be missing out any ergonomics. It also includes a carrying case, something most other polisher do not. Anyone who doesn’t own a polisher yet and is unsure if they need a free spinning orbital or a forced rotation one. It’s a great value because you’re basically buying a Porter Cable 7424xp and a Flex XC3401 in one. This is Makita’s newest polishing tool and it’s a great leap forward. It takes the best feature of the BO6050J, the dual mode free spinning and forced rotation selection, and combines it with the ergonomics of the newer polishers such as the Meguiar’s MT300. The body has the pistol grip of the rotary style tools and the rubber hand hold atop the polisher like the Rupes and Flex. It also has the sweet feature of a rubber tool rest on top of the polisher to allow you set it down without the polishing pad touching anything. It drove me nuts trying to set my Griot’s Garage 6” polisher down without contaminating my pad. Anyone who doesn’t own a polisher yet and is unsure if they need a free spinning orbital or a forced rotation one. It’s a great value because you’re basically buying a Meguiar’s MT300 and a Flex XC3401 in one. One of the most popular tools produced by Italian toolmaker Rupes, the 15ES is a free-spinning long-throw variable speed polisher. This is the polisher that started the long-throw trend so it’s no surprise that they have it mastered. The 15mm throw variation comes with a 5” backing plate allowing the use of 5.5” pads and larger. It has a pistol grip, trigger switch, variable speed control, and soft start. The biggest advantage of this tool over other long throw polishers is that the build quality is second to none. It’s one of the smoothest single head dual action polishers you can buy. You can also purchase replacement parts from Rupes ensuring you’re always able to repair your polisher instead of it being a disposable tool. Since newer versions of this tool have been released the cost has come down and isn’t terrible either. Anyone who wants the speed and smoothness of a long throw polisher and appreciates Italian build quality and reliability. This polisher is everything the 15ES above is but with a longer stroke of 21mm and a larger backing plate of 6”. This means you can polish more area in less time while still enjoying the benefits of an orbital motion over rotary as far as protecting your paint goes. Anyone who wants the speed and smoothness of a long throw polisher and appreciates Italian build quality and reliability and wants to cover more ground than they could with the 15mm version. This is the next generation of the Rupes long throw polishers. Think of it as an upgraded and even more refined LHR 15 ES. There have been improvements to the motor, chassis, and body. It’s claimed to be up to 30% more efficient while also running cooler. This mean, yet again, that you can get more done faster. It also means for a longer life due to better build quality and smoother operation due to better balancing of components. Taking after the Makita, the MarkII series also comes with a rubber tool rest on top. Every polisher should have this feature. It’s so handy it’s ridiculous. Anyone who wants the speed and smoothness of a long throw polisher and appreciates Italian build quality and reliability. You really can’t buy a nicer 15mm throw orbital polisher. 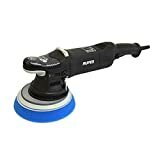 This is Rupes alternative to the Griot’s 3” and the Flex 3” orbital polishers. It’s a micro sized, light weight polisher with a 3” backing plate meant to polish out intricate areas so you don’t have to resort to hand polishing. 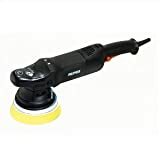 It’s every bit as quality as the other Rupes polishers including rubber grips up front and a rubber tool rest on top so you can set it down without contaminating your buffing pad. The only real drawback is the price. 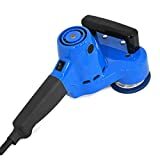 At around $299 most of the time it’s a lot for the hobbyist unless it’s going to be your primary polisher on something like a motorcycle or trike. Anyone who wants the highest quality tool they can get for polishing small, intricate areas or using on a motorcycle or trike. Take everything Rupes is known for and shrink it down into a form factor the size of the Griot’s Garage 6” orbital (GG6) with a throw of 12mm (splitting the difference between the Griot’s GG6’s 8mm throw and the 15mm+ of the long throws) and you get the Duetto. If not for the price I’d say I’d paint it as a direct competitor to the PC and Griot’s. At almost three times the cost of either of those polishers I move it into a class of its own. Kind of like comparing a Camaro to a corvette. Sure they are both RWD with powerful motors and will get you to speed quickly but one of those is going to be a lot more refined of an experience. That’s the Duetto in a nutshell. The Duetto is smoother and has a slightly larger stroke than the 7424xp, GG6, TorqX, etc… The build quality is definitely on point. The only real drawback other than price is the 1 year warranty compared to the GG6’s lifetime warranty. Of course that’s a 1 year warranty on a made in Italy tool vs a lifetime on a made in China tool. That doesn’t change my mind but it might yours. 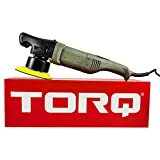 Anyone who looks for impeccable quality and smoothness in their tools and wants something slightly more capable and easy to use than the entry level polishers without putting a car payment down on one of the larger long throw buffers. Originally sold as a pneumatic palm sander it was discovered that this tool makes a great orbital polisher. Compared to the Griot’s G10 it consumes air much faster so you need a good air compressor. If you want a full sized polisher powered by air and have a good compressor this is your ticket. Since it’s sold as a sander it obviously doubles as one of those as well so you get a solid two in one. Anyone with a high cfm air compressor and a preference for air tools looking for a light weight full sized short throw polisher. Would fit in great with a body man’s or painter’s tool set. To me this the best 3” pneumatic dual action orbital on the market. It has a massive 15mm throw compared to the short throw of most 3” polishers et al. It has a max speed of 11000 orbits per minute meaning it can really cut into paint to for quick spot defect removal. The orbiting motion protects your paint from overcorrection, holograms, and burn through. It’s also Italian made not china made and relabled like the Griot’s Garage 3” pneumatic. It also includes onboard storage for the pad removal spanner. In typical Rupes fasion, it can be used as a high end sander as well. Just be careful with the speed and large orbit. It removed material quick! As with all Rupes tools, it only has a 1 year warranty but you’ll probably never need the warranty anyway. 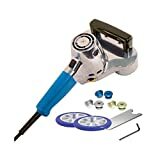 Anyone with a preference for air tools that need to do intricate detail work or spot repair. Great for anyone who does auto body or paint work and runs into clear coat runs and dirt nibs. Even smaller than the LHR75 is the pneumatic TA50. It’s a 2” air run sander and orbital polisher. It has a short stroke but still removes material quick. Everything about the LHR75 applies with the exception of fitting into even tighter areas. Even smaller than the pneumatic TA50 and electric LHR75E is the battery powered Rupes Bigfoot Nano iBrid. It’s a 1” cordless lithium ion battery powered tri mode micro polisher than be ran with a cord or battery. The Nano iBrid can be switches between rotary, 3mm throw orbital, and 12mm throw orbital to fit any spot work scenario. It’s also available in a short and long neck version to ensure it can be used to polish nearly anywhere. This polisher can be used to spot correct clear coat defects, sanding marks, remove nibs, polish out tiny areas such as around emblems and trim, and remove grease, grime, and industrial fallout. It can also be used to polish engine bay components and other intricate details. It does so using a vast assortment of pads and brushes. Anyone who needs the ability to do extremely detailed work or anyone who suffers from conditions that prevent them being able to spend long times hand polishing small areas. Would make a great tool for the owners of motorcycles, trikes, and personal water crafts. Every pro detailer needs this kit. It will pay for itself in time savings and increased productivity. Rotary polishers have been around for decades. These are lot more simple in design and operation than dual action polishers but take a lot more skill to master and have a much smaller margin for error. The rotary action generates a lot of speed and a lot of heat if you’re not careful with means you can cut through paint super-fast, sometimes too fast, and end up with buffer trails, holograms, and straight up missing paint. Rotary buffers are recommended only for the experienced who are looking for faster and/or more aggressive initial correction. This can either be a pro looking to speed up their work to increase output and revenue or the extreme hobbyist who has mastered the DA and is looking for a new challenge or to save personal time. Similar in form to an angle grinder with the exception of the top mounded D shaped handle. It has a trigger switch with lock and top side variable speed dial. The backing plate is 7” for use with 7” and larger pads. The motor is extremely powerful and drives that 7” pad with ease making short work of large corrections. The only real drawbacks are the comparatively short 1 year warranty and the level of noise this buffer generates at high speed settings. Anyone looking for a lightweight yet powerful rotary for fast correction of large vehicles. Similar in operation to other rotary polishers of the same size. The TorqR has a comparatively small 5” backing plate for more intricate work. It also ditches the trigger for a top mounted power switch and digital speed output versus a dial. It uses a standard 5/8” threaded spindle so you can trade out backing plates with most other rotary backing plates. Anyone looking for a budget rotary who dislikes trigger switches and wants some newer bells and whistles. This a pro quality rotary built for pros like auto detailers, fabricators, painters, and body men. It’s ruggedly overbuilt and designed to reduce fatigue from long use. It has a two finger trigger switch, top mounted speed control, and large D shaped handle. All of these make it easy to hang onto and control. The backing plate is 7” so it’s a great for working large areas on large vehicles and watercraft. On the down side, the head of the tool isn’t designed in such a way to be very comfortable to use without the handle. If you’re not a handle user you’ll want to look at other tools in this list. On the upside it has a molded in tool rest allowing you to set it down without contaminating your buffing pad. What I really like is the 3 year warranty. So many tools this day only have a 1 year warranty. If you’re a pro buying a tool to make money with you want to be sure it lasts as long as it can to increase the return on owning it. Pro’s who need a rugged tool to cover a lot of ground fast. The long warranty increase confidence in investing in such a tool. If you prefer refinement over ruggedness then the Flex PE14-2-150 is your ticket. It’s engineered and built in Germany and was designed to be as pleasant to use as possible. The motor uses a combo of planetary and bevel gears to reduce noise and incorporates cooling fins to create a heat extracting fan. This makes the tool very smooth, quiet, and cool to use. The switch is a variable speed allowing you to slowly ramp up speed to to the selected speed on the dial. There is also a lock for the trigger so you don’t have to hold it down. The polisher also includes an electronic speed sensor and control to ensure the pad maintains steady speed regardless of pressure allowing for a more even finish helping prevent buffer trails and holograms. The only drawback is the 1 year warranty compared to the DeWalt’s 3 years. Reports of failures are rare though so the warranty doesn’t shake my confidence much. I just wish it were longer. Pros and hobbiests looking for the most refined and user-friendly full size rotary polisher. Anyone sensitive to noise, vibration, or tool weight will want to opt for this tool. One of the few compact electric rotary polishers. The Flex PE8-4-80 is designed for a 3” backing plate (one is not included) to run 3-4” pads meant for intricate detail work and spot correction that would otherwise leave you polishing by hand or using an air tool. It’s great for smaller vehicles with complicated panels like motorcycles, trikes, and side-by-sides. 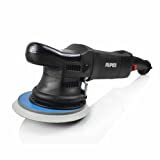 The polisher also only weighs 4lbs making it one of the lightest electric rotary polishers you can buy. Professionals and hobbiests that need to spot correct or polish intricate details on a car, motorcycle, trike, or side-by-side. Would work great on the gel-coat on a pwc like a waverunner as well. The 3403 is essentially a lighter version of the PE-14-2-150. It has a higher listed max speed but you’ll never use this speed when polishing paint. The sweet spot for compounding with this tool is around 1500RPMs. Unfortunately it also generates a frequency at this speed that many find annoying. I do prefer the topside handle on this tool over the PE-14. In the forward position it allows holding the tool like you can on the similarly sized long throw random orbital polishers. 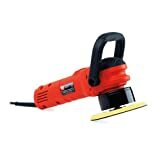 For those that prefer a side handle you can use one with this polisher as well. If weight is the most important factor to you or you really like holding your polishers by the head and tail rather than by a large handle I’d recommend this over the PE-14 otherwise I’d get the PE-14 to avoid the harmonics from this design. 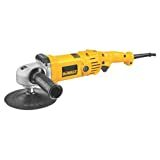 This polisher comes with a 7” backing plate meant for 7.5” and larger pads to make short work of large projects or jobs. It’s built with speed and consistency in mind. The motor includes an electronic controller to maintain speed regardless of pressure and ensure a soft start when powering on the tool to keep from losing control of it or slinging product everywhere while you spread it out. The ridiculous 10amp motor provides more than enough power to company any job you would use a rotary for. There is also a wire mesh intake cover to prevent wool fibers and polish dust from being ingested into the motor. It has a top mounted D handle for those who prefer that over the side handle of the traditional angle grinder style rotary buffers. It also has a rubber tool rest on top to allow setting the tool down without contaminating your pad. I love that feature on every polisher that has it because I use it ALL THE TIME. The only real drawback is the short 1 year warranty. Pros and hobbiest that want a good bang for your buck rotary that’s fully capable and feature rich. Similar in power to the 9237c this polisher looses the rubberized handle, rubber coated motor housing, and mesh motor screen to save a few dollars. 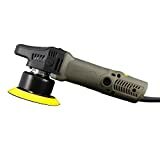 The 9237c is actually an updated version of this polisher and is the one I would recommend between the two. Pros and hobbiest that want a good bang for your buck rotary with no frills attached. I really recommend looking at the updated 9237c above. If you’re looking for a no frills, extremely well built, powerful polisher with a long warranty then you should look at the Milwaukee 5460-6. It has an 11 amp motor and 7” rubberized backing plate that effortlessly move 8” and larger pads for really fast work on large jobs. The body is the typical side handle and pistol grip angle grinder setup you’re used to seeing on rotary polishers. Though it includes a nice rubberized tool rest on top so you can set the tool down without worrying about it falling over and contaminating your pad. The real differentiater with this polisher is the 5 year warranty. Any pro or hobbiest looking for a rugged no frills large sized buffer with a long warranty for peace of mind. This is a 2” pneumatic rotary polisher. It’s meant for intricate detail work or spot correction and repair. It comes with both a 2” and 3” backing plate allowing for a mix of 3” and 4” pads. The hood and loop backing plate is also compatible with all common 3” and 4” pads so you’re not stuck with one system. The small footprint of this polisher allows using The BOSS system’s polishes and compounds should you already own then for your larger Griot’s Garage The BOSS G10, G15, or G21 polishers. It’s air consumption is also very small at only 3cfm @ 90psi. You should be able to run this on a pretty modest air compressor. The professional body man or hobbiest who needs to do spot repairs or correct intricate panels. Great for motorcycles, trikes, and personal water craft such as wave runners.